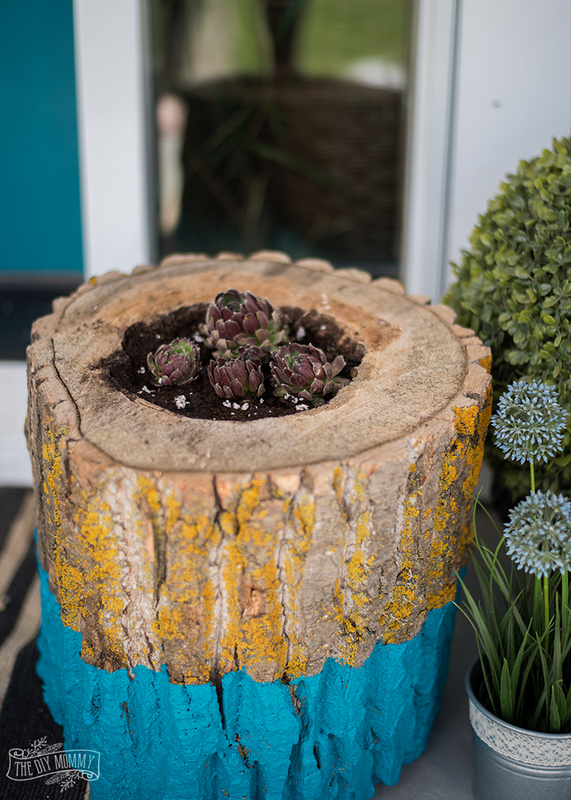 A paint-dipped log planter for your succulents – it’s everything you never knew you wanted! This cute little project is simple, quick, and it’s a great one to involve the kids with. 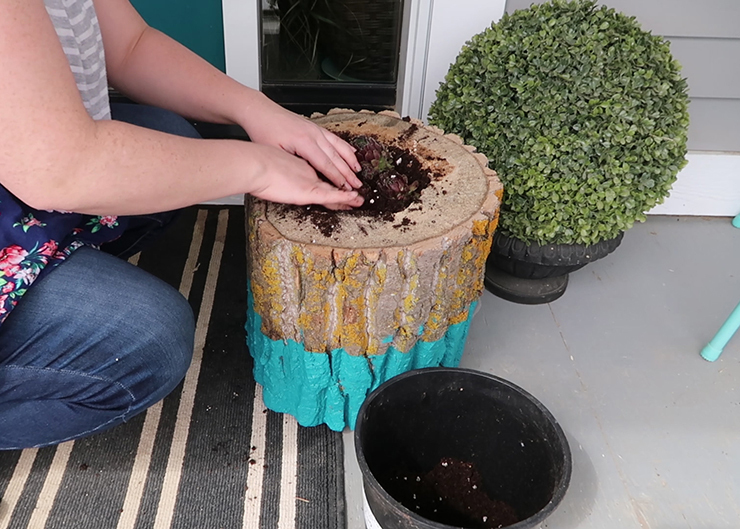 Let me show you how easy it is to make this fun log planter for your succulents this Spring, and make sure to scroll to the end of this post to see more plant & flower ideas from my blogging friends for this month’s Outdoor Extravaganza! This project is part of this month’s Outdoor Extravaganza hosted by the talented Shauna of Satori Design for Living. 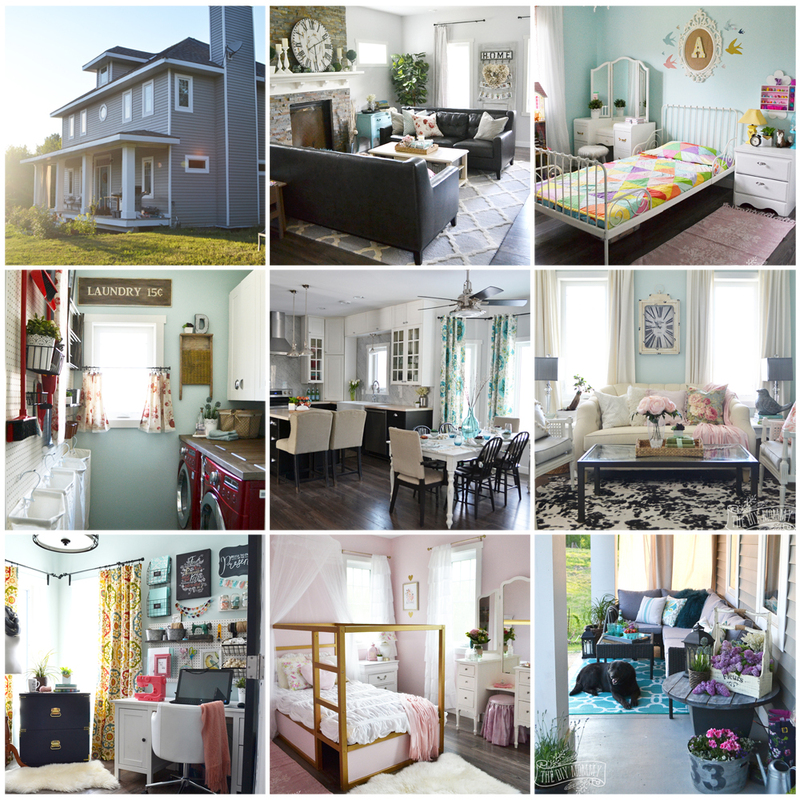 Make sure to come back next Thursday to see our outdoor decorating and entertaining posts. 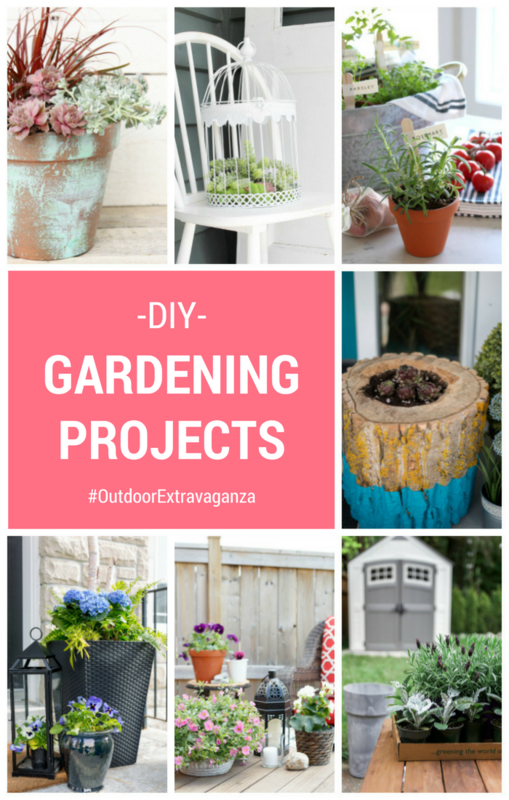 There will also be a link party on May 26th where you can share YOUR outdoor DIY ideas! 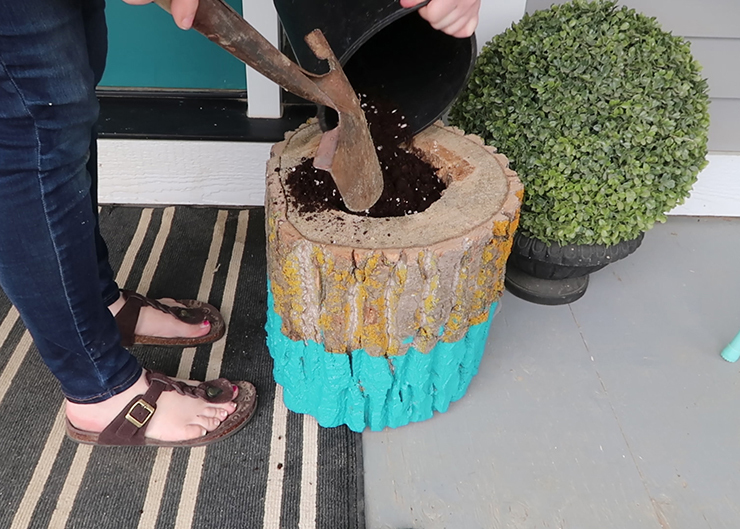 This rustic log planter cost me $0 and it came together in an afternoon. 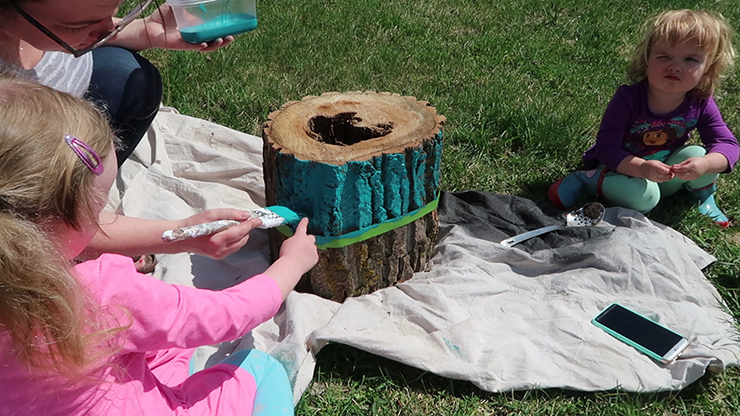 My girls enjoyed helping me paint it and plant the baby Hens & Chicks plants! 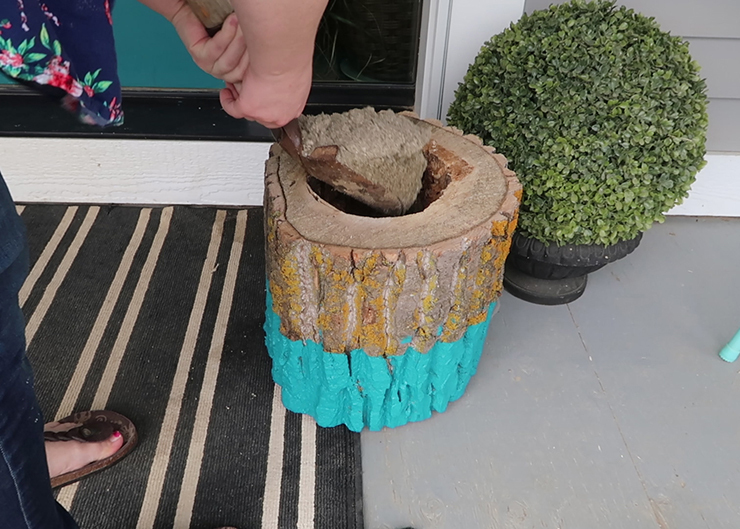 You could use a different colour of paint for the paint-dipped look, or skip the painting all together – I thought it was a fun pop of colour for our yard. 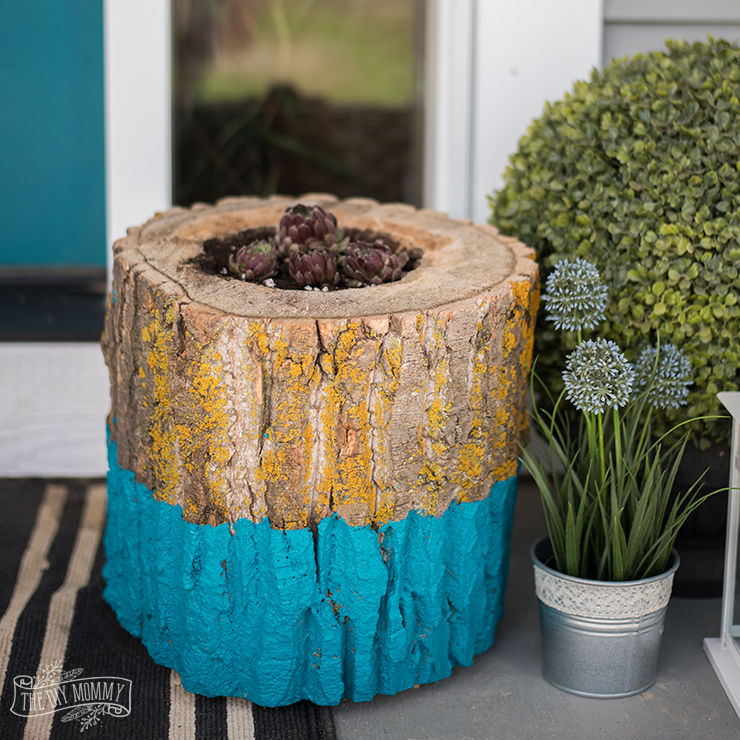 Find a log or a stump with a center that’s been rotted out. We have a big pile of firewood behind our house that luckily had a few logs like this! 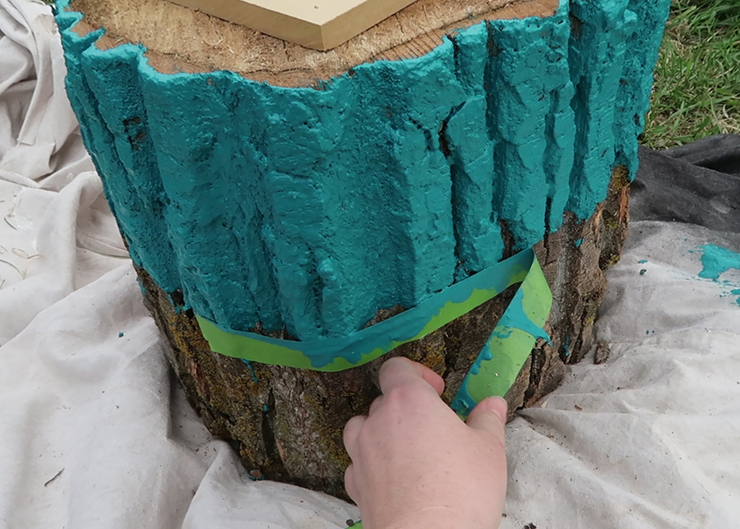 Wrap a piece of painter’s tape around the log (I put ours in about the middle), and paint one half with any extra paint you have on hand. I used a latex paint in a lovely teal colour. My girls enjoyed this step, even though Baby B is giving you the stink eye in this photo. 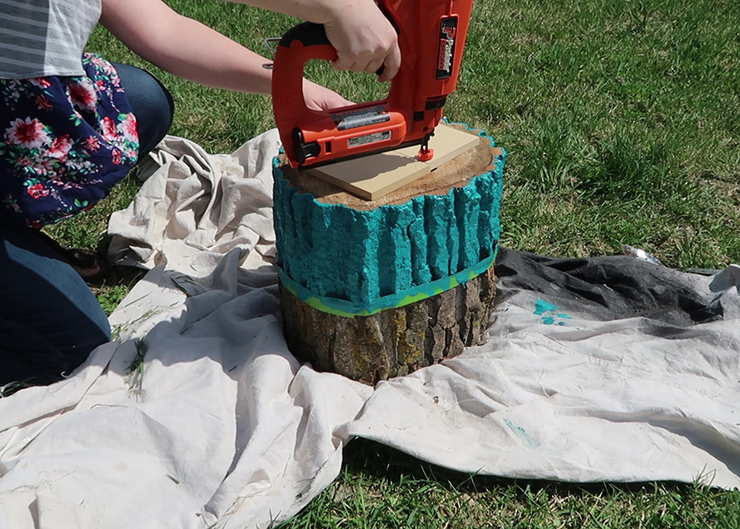 Next, nail a scrap piece of wood to the bottom of the log planter to seal the hole. This stops any soil from falling out. Fill the hole in the log about half way with some sand. Fill the rest of the hole with potting soil. Plant a few succulents into the soil, or some Hens & Chicks like we did. Enjoy! Now, wasn’t that easy and a cute conversation piece for your outdoor area? 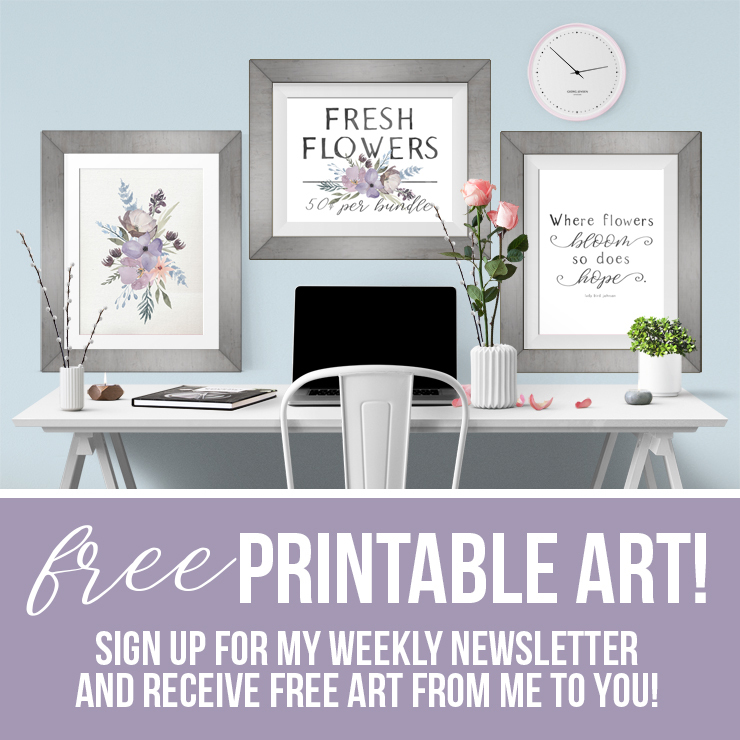 Now go check out some more plant & flower ideas to fill your Spring with green from my blogging friends! 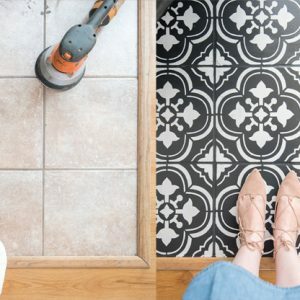 SUCH a creative idea! LOVE that you added that pretty pop of colour! Very cute, Christina!! 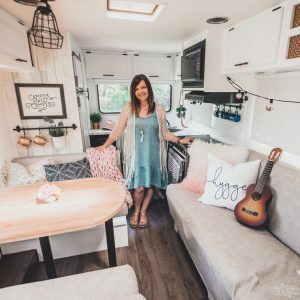 I love the combination of my faves – rustic and adorable all at once!! So, so cute. Love that you got the girls involved too. They must have so much fun having you as a mom with all of your creativity! 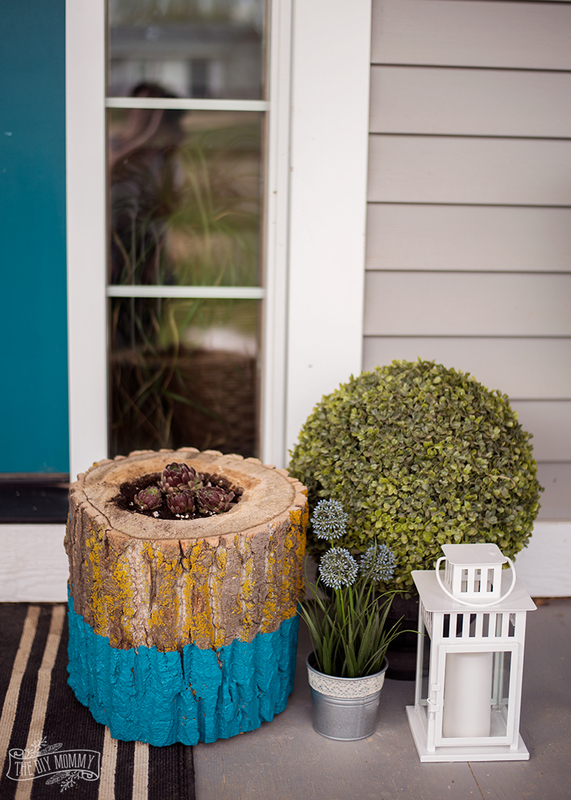 The bright blue is a perfect choice to add a pop of colour to your front porch. Thanks for joining in once again! Such a clever idea, Christina! And I love that stink eye, haha. Amazing. Genius! 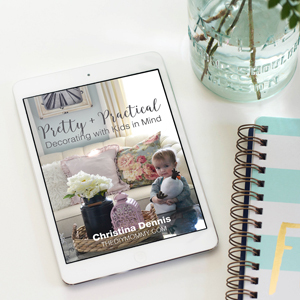 Absolutely genius idea (and oh so beautiful) Christina! I would have never in a million years have thought of this, love how it turned out!